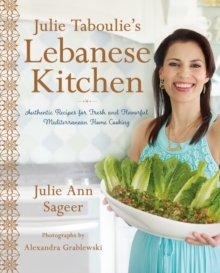 Since she was six years old, Julie Ann Sageer (nicknamed Julie Taboulie by her close-knit family) has had a passion for cooking the meals of her Lebanese heritage. Just like in her Emmy- nominated cooking show Cooking with Julie Taboulie, each of her recipes comes with hands-on instructions, tips, and tricks for making homemade Middle Eastern dishes using heaps of fresh, seasonal ingredients. Here you'll find dishes that range from classics like falafel, shawarma, and (of course) taboulie, to warming Bazilla - a stew of tomato, green pea, and lamb - to honey and rosewater-infused desserts. In these 125 recipes, you'll learn how easy it is to make such Lebanese staples as fresh labneh (strained yogurt) and how to put together your own delicious, multi-purpose spice mixes. In addition to the delicious meat and chicken dishes, Lebanese cuisine offers a wide variety of vegetarian, pescatarian, vegan, and gluten-free dishes, usually with no substitutions whatsoever! Every chapter includes a multitude of dishes for eaters of all kinds and preferences, from meat-lovers to veggie-heads and everything in between.